Ronaldo Makes History As Real Win 12th Champions League Title – Royal Times of Nigeria. Cristiano Ronaldo became the first player to score in three UEFA Champions League finals after setting Real Madrid on the lead in Saturday’s final clash against Juventus. The Portuguese made history with the strike while his second helped him overtake Lionel Messi as this season’s competition top scorer on 12 goals. Ronaldo has taken his UEFA Champions League-record career tally to 105 with his brace at the Millennium Stadium in Cardiff. He had previously scored a late penalty for Madrid when they beat Atlético 4-1 after extra time in Lisbon three years ago and also registered in Manchester United’s 1-1 draw with Chelsea in Moscow in 2008, though he missed in the shoot-out win. 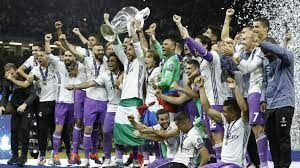 Real Madrid were also crowned European champions for a record 12th time after outclassing Juventus 4-1 with Ronaldo’s brace, as well as other goals from Casemiro and Asensio.